During hot, dry spells, keeping your garden watered is essential to the well-being of all the plants that you grow, including hedges, flowers, grass, and vegetables. By choosing the best garden hose possible, it means that your garden will never lack the essential water that it needs to thrive. You might think that a garden hose is the sort of product where there’s not really a lot that would differentiate the various choices that you have, but there are several. By reading our buyer’s guide you will discover the most important features, and why each one of them should be considered before making your choice. You will find most garden hoses come in lengths of 50 feet once they are fully expanded. For most gardens this should be sufficient, however, some will have longer options of 75 or 100 feet. Always measure the length from the nearest faucet, to the outer limit of your yard or garden, and if you are still unsure, err on the side of having a hose which is longer than you need, than one that is too short. The length of a hose will influence the water pressure so if this critical to how you plan to use the hose, then take this into account. One other thing to note is whether the hose you buy can be extended. Often it is possible to connect one hose to another using a connector to extend it. Modern garden hoses are no longer just made from rubber, as they once were. Today, you will find hoses made from stainless steel, plastics, and latex. Each of these will have an influence on the weight of the hose, which can be between 1 and 6 lbs. These are not particularly high, but be aware of them when choosing, especially if you need to carry the hose any kind of distance, such as in a very large garden. Higher quality hoses will use brass for the connectors, which is a strong, and durable material, and is not prone to rust. Others will likely use plastic connectors, which are perfectly fine, albeit, more care will need to be taken when fitting them to faucets. Garden hoses can be used for more than just watering your garden. Washing your car, cleaning pathways and patios, filling paddling pools, and even giving your dog a nice cool shower are just some of the many functions they can perform. For each of these, the nozzle on your garden hose may have a setting where the flow and power of the water coming out of it can be adjusted. These may differ somewhat for each product, but they’ll normally include: rinse, shower, mist, center focus, flat spray, full spray, and mist. Please note that not every hose will come with a spray nozzle included, so check for this to see if you need to buy one separately. Garden hoses will have been tested to determine what are the minimum, maximum, and optimum water pressure that they can be used with. If you are unsure what the pressure is from your faucet, then it might be worthwhile testing this to ensure the hose you buy is suited to it. Minimum water pressures are generally around 50-60 PSI (3.5-4 bars), and the maximum water pressure about 175 PSI (12 bars) on some of the stronger and more robust garden hoses. The optimum will tend to be should around 85 PSI (6 bars). You may well remember those times when hoses would easily kink, stop the water flow, and worse still, cause the faucet end of your hose to leak and flood everywhere. Thankfully, this should not be a problem any more thanks to the sorts of materials used for modern hoses. Nevertheless, always check that the manufacturer has stated that the hose is kink free. While it may not be enough to swing your decision, when manufacturers offer extras with their product, it can sweeten the deal. 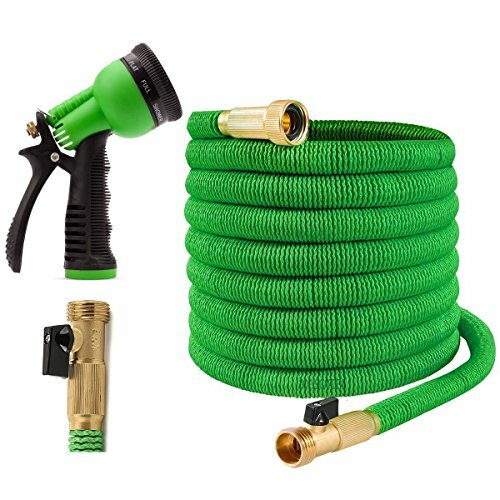 For garden hoses, these can include, a sturdy carry bag, special hanger so you can hang it up on your garage or shed wall, and most importantly, the spray nozzle. 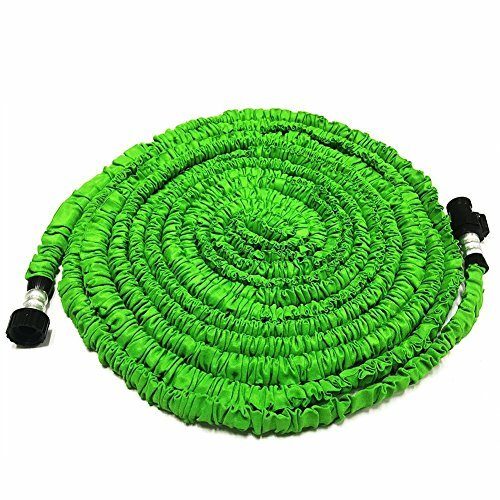 This garden hose from Joey’s Garden is 50 feet long when expanded, so it should be suitable for most small- to medium-sized yards or gardens. It is made from a flexible, and strong material, which, more important than anything, is kink-free. The recommended water pressure minimum and maximum levels are 60 PSI, and 115 PSI, with an optimum of 85 PSI. If you are unsure what pressure your faucet can produce, then it is advisable to check it first. At either end of the hose, you have a brass connector, which not only is extremely durable, it should not be susceptible to corrosion, such as rust. One of the most impressive aspects of this garden hose is how light it is. It weighs only 3 lbs. which makes it one of the lightest we have ever reviewed. In our buyer’s guide we talked about nozzles, and how they can give your hose a lot more uses. This hose is supplied with a nozzle that has multiple actions, which include, center, stream, cone, mist, shower, full power, flat and vertical. There are instructions which will advise you what each of these is best suited for, but you can also experiment a bit with them yourself, although we do not recommend using full power on your dog! Other extras that come with the hose, are a hook, for hanging up the hose, and to keep everything neatly stored together, there’s also a carry bag included. With the word ‘expandable’ in the title, it makes sense that we start with that. The material used for this hose is latex with a solid core and a flexible outer sheath. This gives the hose the ability to expand when used toward its full length of 50 feet, and contract again when it is being rolled up, after use. The connector on each end is made from brass, with a 3/4-inch locking ring. The connectors have a rubber seal with their housing to prevent leaks. One of them also has an on/off valve which allows you to switch on the water flow when you are ready to use it, rather than having to go back and forth to the faucet. When the water supply is on, this hose can operate up to an impressive 174 PSI, and you can use it with cold or hot water up to 133°F, which is 45° Celsius. A nozzle is supplied with the hose to give you the most use from it. It can be adjusted so that the water flow is suitable for washing down cars or motor homes, watering plants, or for the kids (and the adults) to have some fun splashing each other on a hot sunny day. The manufacturer obviously believes in their product, as they provide a lifetime guarantee. So, whether it is 1, 2, 5, or 10 years old, they will replace the hose, or provide a refund, if yours develops any kind of fault. Where you have a very large yard, or if you have any other scenario when a longer hose is required, then the fact that this one can go to 100 feet long, should make it one that deserves your consideration. It can stretch to this length due to the double-core latex hose, and flexible polyester on the outside. In terms of water heat and pressure, it will comfortably be able to withstand a temperature of up to 133° Fahrenheit, and pressure up to 174 psi, so unless your water supply is unusually hot or has an excessive pressure, it will be safe to use on any faucet with a 3/4-inch connection. The 3/4-inch connectors on the hose are both made from brass, so you should be confident in their ability to last. To help prevent any leakage from either end of the hose, the brass connectors use rubber seals inside, and on the outside, they have heavy-duty rubber washers as well. To prevent you from having to go back and forth to switch the water on or off, at the end of the hose which you are using, there is a valve where you can do this more easily. Carrying the hose shouldn’t present too many issues, given that it weighs less than 6 lbs., which for a 100-foot hose is very light indeed. Whenever you are finished using it, you simply wrap it up, which the flexibility of its materials will allow you do without much effort. The supplied carry bag lets you keep it stored neatly. Note, this does not come with any attachments, so if you want to use it with a nozzle, this will need to be purchased separately. The name of this hose is a bit of a giveaway in terms of what it is made from, so we’ll address that straightway. It’s made from stainless steel, so it should be a lot tougher than those hoses made from latex or plastic. This should also mean that it will not suffer from cracks, tears, punctures and even bites from your dog’s teeth if they decide that it is something they want to chew. Although it is tough, the hose is still very flexible, because of the way in which the stainless steel sheath is constructed. It is like what you might find on a shower hose, for example. This flexibility should also prevent any kinking from occurring. 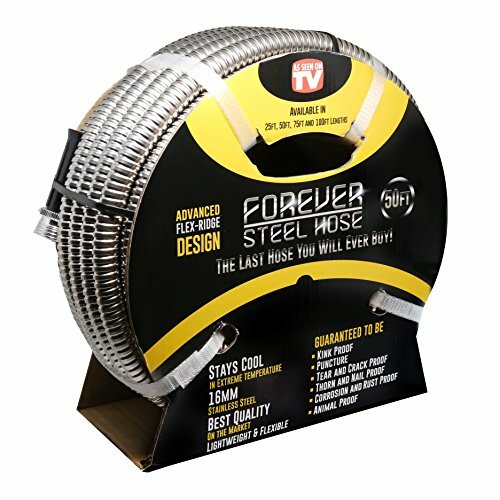 With its steel construction, you might expect that this would mean that the weight of this hose is a lot more than comparable hoses, but the opposite is true. It weighs less than 5 lbs., which puts it in a lower weight bracket than many hoses made from plastic or latex. Another advantage of stainless steel is that it reflects sunlight and therefore the hose itself should stay cool, even if you are using it in very hot and sunny conditions. The size of the two connectors is smaller than the standard ones used on hoses, so you may need an additional connector to suit your faucet size. You also do not get any nozzles supplied with it either. At the core of this garden hose is flexible latex which expands as more water pressure is used. This, and the outer material, which is polyester fabric, mean that no matter how much water is flowing through it, the hose will still be flexible enough to make it easy to maneuver, and direct it towards whatever you are watering or washing. Brass connectors on the hose provide a strong, and corrosive-free means to connect the hose to the water supply at one end, and whichever attachment you are using at the other. Please note that no attachments are supplied with the hose. Even without an attachment, you can still adjust the flow of the water, using an on/off valve which is built into one of the connectors. The connectors also help to reduce leakage at either end, thanks to a rubber washer on the exterior of each one, and a rubber seal on the inside of both. If you plan to use the hose to wash a car, RV or campervan, you may want to use warmer water for the most effective results. In this case, it is worth knowing that this garden hose, can be used with water with temperatures up to 133° Fahrenheit. In terms of the pressures it can withstand, you should be able to use up to 173 psi safely. One of the best features of this hose is how easy it is to store. Although it expands to 50 feet when in use, it will go back down to its original 17 feet when you are finished. This, combined with its flexibility, makes rolling it up for storage easy, and the included carry bag lets you keep it all wrapped up neatly. Can expand up to 50 ft. 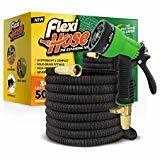 This garden hose is one which seems to be specifically designed to be as flexible as possible, while reducing as much as possible, any risk of it twisting or kinking. The outer material is a flexible polyester, and within, it has a latex core, which is strong enough to withstand the pressure of the water, while at the same time being flexible enough to make the hose easy to maneuver. When the water supply is switched on, the hose will expand to its maximum length of 50 feet, which should make it long enough for most gardens and yards. If you wish to use hot water, the hose is safe to use with water up to a temperature of 208° Fahrenheit. Both connectors are made from plastic, so they are not going to be as tough as brass connectors; nevertheless, if used properly they should suffice. One of them has a valve to switch the water outlet end of the hose on or off. Note that there is no nozzle or attachments supplied with this hose. Once you have finished, the hose can be easily coiled up thanks to its flexibility, and neatly hung in a garage or shed. All the hoses we reviewed are certainly worthy of your consideration, and we recommend all of them. 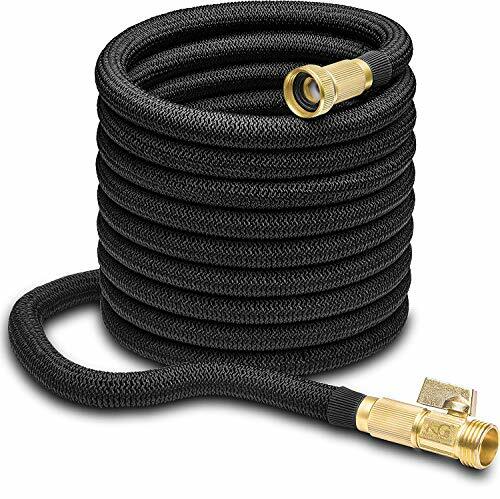 Having compared them all, we have opted for Joeys Garden Expandable Garden Hose as our best garden hose, simply because it offered everything we believe a garden hose should have. It is flexible and extends up to 50 feet, and its brass connections are designed to last, as is its durable core. It is lightweight, easy to maneuver, and can withstand a water pressure of up to 115 psi. Best of all it comes with a nozzle which can turn your hose into one with multiple uses.